Please note that the following questions and answers are for general information only and do not constitute legal advice to address any specific immigration matter. Each immigration matter has its unique set of facts, which may or may not be applied to questions and answers discussed below and therefore it is advisable to contact an experienced immigration attorney to evaluate and assess your immigration case. What is a “work visa”? How is it different from Permanent Residence (Green Card)? Work visa is a temporary authorization granted by the US government authorizing certain employers to employ foreign individuals in the US. Work visa is normally “employer-specific”, which means that the visa being sought must be petitioned by a US employer through employment offers and approved by the Immigration Services before the foreign individual may begin the employment with the petitioning employer. In addition, the approved work visa authorization is restricted by the terms stated in the work visa petition and that the foreign individual’s employment is limited to the position offered at the petitioning employer. Work visa contains certain terms and has a validity period unless the petitioning employer renews or extends the work visa for an additional validity. Permanent residence, or “Green Card”, is a permanent authorization granted by the US government to foreign individuals to live and work in the US. Normally, permanent residence is valid permanently provided certain conditions are met during the term of the validity. Permanent residence can be secured through employment offers (Employment-based) or family relationships (Family-based). Permanent residence has unrestricted employment eligibility as a US citizen and is not limited to a specific employer. My office regularly handles work visa and permanent residence matters for employers and individuals. In the life of an employee’s immigration matter, petitioning a work visa by an employer to the US Citizenship and Immigration Services is usually the first step for the employer and employee before pursuing US permanent residence as the latter requires significant amount of planning and time, during which the employee must maintain a legal work visa status in the US. What are employers’ eligibility/requirements for sponsoring work visas? Generally any US employer with a Federal Tax Identification number (EIN) can be a work visa sponsor to hire foreign employees. Sole proprietorship, partnership, C or S corporation, and Limited Liability Company are eligible business entities to sponsor work visas. However, in practice, small or recently formed businesses encounter more challenges from the Immigration Services than larger and established businesses due to the lack of business history/credentials, lack of established business processes, uncertain nature of the employment opportunity, questionable compensation requirements, among other factors. Nonetheless, there have been reported precedent decisions ruling that the size of the business has no bearing in sponsoring work visas and therefore it is extremely critical for new and small business to devote extra time and efforts in the planning phase of petitioning work visas. In addition to the above EIN requirement and “new business” discussion, for L visas, there must exist a foreign entity from which the sponsored employee is being transferred to the US company. The foreign entity and the US company must have a “qualifying relationship” and the employee being transfer must also has prior employment history at the foreign entity in certain managerial or unique knowledge capacity in order to be considered by the Immigration Services as “intracompany personnel transfer”. L-1 visas are available to managers or executives of international businesses seeking to explore or establish new business ventures in the US. These new US ventures are eligible for a one-year validity L visa under the Immigration Services’ “New Office Rule”. In summary, there is no legal requirement restricting small or new businesses to sponsor work visas. However, small and new businesses require more detailed planning, careful structuring and significant amount of time in preparing the visa petition in order to achieve successful results. What are employer’s liabilities involved for sponsoring a foreign professional’s work visas? In addition to complying with the State or Federal employment laws and regulations, employer’s liabilities in sponsoring a work visa varies and depends on the type of work visas involved and the terms stated in the visa petition. Generally these terms may be relating to the wage being offered, location of the job site, financial conditions of the employer or working conditions of the employees. Employer’s responsibility may also include keeping records and documentation for inspections and public access. As long as employers fulfill and comply with the terms stated in the visa petition during the validity of the employee’s work visa, hiring a foreign talent and professional poses no different risks from hiring a US resident employee. How long does it take to secure for a work visa? The processing time for work visa matters varies from time to time as it is an on-going and evolving factor at Service Centers of the Immigration Services. Generally speaking, 2-4 months are common in work visa matters with rare cases taking up to 6 or more months. For cases require immediate results and speedy processing, the Immigration Services offers a “Premium Processing Handling” request for most work visa matters. For Premium Processing Handling cases, an additional Premium Processing fee is paid to the Immigration Services to expedite the reviewing process for the case within 15 calendar days from the receipt of the petition. Premium Processing Request is also available in certain permanent residence matters. What are the steps involved in applying a work visa through your office? Typically, work visas are petition-based administrative legal matters and therefore the process at the very beginning involves analyzing necessary information of employer and employee in order to determine and structure the possibility of petitioning a work visa for the specific employment arrangement. Once the visa feasibility is determined, the next phase of preparation is to collect and gather the required documentation and information from both the employer and employee. Once the required information and documentation are collected, drafting and preparing legal forms and supporting letters are to be followed with reviews and revisions with the employer and employee. If all forms and supporting letters are to employer’s approval, documentation and organization of the petition will ensure that the petition provides a clear road map to demonstrate employer’s work visa eligibility to the Immigration Services. The above process entails only the preparation aspect of the work involved in preparing work visa petitions. 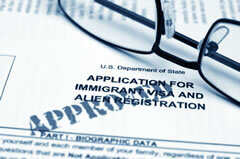 During the preparation of the process, an immigration attorney is usually the one who has the required knowledge from the understanding of immigration statues and regulations, agency adjudication manuals, internal policy memorandums, on-going governmental updates procedural changes as well as administrative precedent decisions addressing each specific scenarios and challenges in preparing each case. What happens next after the Immigration Services reviews the work visa petition? Once the work visa petition is reviewed by the Immigration Services, the Immigration Services will either: 1) approve the petition, followed by mailing of the Approval Notice (I-797) to the attorney of record and employer; or 2) issue a “Notice of Action” or “Request for Evidence”, commonly referred to as “RFE”, requesting addition information or evidence to clarify certain issues raised by the Immigration Services. In the above 2) scenario, depending on the type of issues or questions raised by the Immigration Services, additional information and documentation should be provided to the Immigration Services to address the Immigration Service’s questions. The preparation involved in preparing a rely to the RFE can easily take more time than starting anew of a work visas matter and it is always stressful to the employee and employer due to the uncertainty of the outcome. Therefore, advanced planning and careful structuring cannot be over-emphasized, particularly for small and new businesses. Do family members of employees also need separate visas? Spouse and children under 21 are eligible to apply a dependent visa based on the principal’s work visa. Except in L and E visas, spouse having dependent visas are not eligible for employment. They are, however, eligible to attend school and live in the US. How do you charge for handling work visa and immigration matters? What are the attorney fee arrangements? For most work visa and permanent residence matters, my office charges a flat-rate attorney fee plus applicable government filing fees. The flat rate attorney fee varies and depends on the type of work visa and the complexity of the matter involved, all of which are in proportion with the time that I will be devoted in preparing the petition. The fixed attorney fee, however, includes responding to the US Immigration’s RFE, if any. For preliminary immigration case inquiries, my office charges a consultation fee of $175 for an in-person meeting at my office for reviewing and analyzing the inquirer’s immigration matters. Free consultation is available by telephone calls only. Lastly, immigration and work visas matter are governed by federal laws and regulations and therefore regardless of the employers’ or employees’ physical location, my office will be able to assist in work visa matters from the City of San Francisco. Many of my clients include those located in different states and from abroad with whom I have never met in person but we have had successful and on-going working relationship in resolving their work visa and immigration matters.